The New Forest Cycling Week was founded in 1975 and for 35 years was based at Roundhill, a Forestry Commission campsite near Brockenhurst. 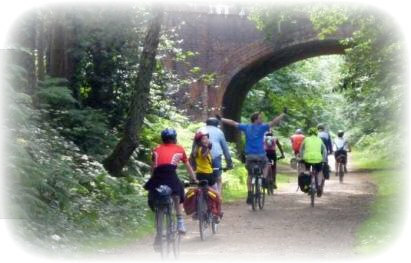 In 2010 the New Forest Cycling Week moved to the UK Youth Activity Centre at Avon Tyrrell Manor near Burley. The New Forest Cycling Week is normally held around the last week in July and attracts approximately 200 attendees each year. It is an informal rally for cycle campers, free from pressure and over-organisation, yet offering activity for all those who wish to join in. It's a rally for cycling families, small groups and individuals whether new to camping or indeed the more experienced and age is immaterial! There is plenty to see and explore in this unique area. The many minor roads and tracks make enjoyable and safe riding for families and younger riders. There is normally something taking place most days along with various on site activities during the evening. On Site activities during the week normally include a Barn Dance, BBQ, Cheese and Wine, Children’s Time Trial, Children's Bicycle Gymkhana and use of the Avon Tyrrell adventure facilities for children using Avon Tyrrell's instructors. Please use the tabs on the right for more information about the rally.